Global Encapsulated Flavors and Fragrances Market size was worth at over USD 6 billion in 2017 and will witness over 4.5% CAGR. Potential applications in various industries such as textile, food & beverages, home and personal care products will drive the encapsulated flavors and fragrances market share over the forecast period. Odour and flavor masking, controlled release properties along with precision in delivering nutrient are among key characteristics propelling the industry growth. Technological developments coupled with increasing R&D investment will stimulate the business growth. Many major market players are focusing on new product launches and innovations to attain market expansion. Textile and retail industry expansion across the globe is a major factor fuelling the encapsulated flavors and fragrances market size. Several factors such as changing consumer trends, rising population, improving purchasing power and robust economic growth are fuelling encapsulated flavors and fragrances market growth. Increasing consumer spending on cosmetics and personal care products along with proliferating usage of fragrant products in home care products will support the encapsulated product demand. Changing consumer lifestyle and rising packaged food & beverages demand due to the hectic schedule is projected to augment growth prospects for the overall market share. Shifting inclination towards fast food and RTE food will further support the industry growth. Limited availability of food-grade materials and high product costing may restraint the business expansion. The installation of encapsulation technologies requires higher initial investment depending on the quality of material used for the system and also requires technical expertise which may result into high price trend. 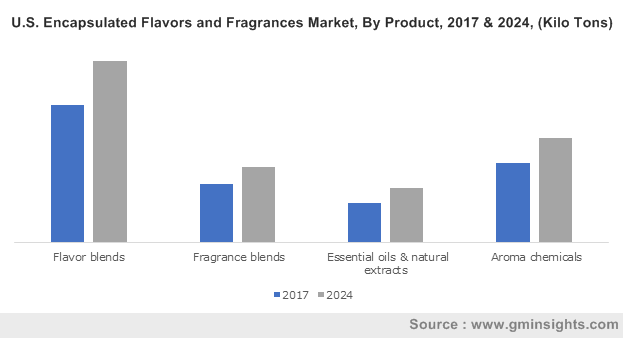 Lack of technical support accompanied by stringent government norms regarding the consumer’s safety are further expected to hamper the encapsulated flavors and fragrances market growth. Flavor blends held the highest market revenue share of around 40% in 2017. Shifting eating habits and increasing preference for fortified foods are fuelling the encapsulated product demand. In addition, improved taste, extended shelf life and efficient ingredients release properties will remain key factors boosting the business size. Essential oils & natural extract is the fastest growing segment and will witness growth over 4.7% over the forecast timeline. Health awareness leading to enhanced demand for encapsulated minerals and vitamins will stimulate the industry growth in essential oils & natural extracts market. Minimal side effects and large availability of such products will further propel the product penetration during the forecast period. Physical process dominates the market and generated revenue over USD 5.5 billion in 2017. This technique comprises of various processes such as atomization, extrusion, emulsification and fluid bed coating. High production capacity, economic feasibility, feedstock versatility and particle size flexibility are driving the physical process technique adoption in the industry. Chemical and physio-chemical process held over 13% of the global market share in 2017. Coacervation, co-crystallization and molecular inclusion are the various processes included in this technique. Easy process and flexibility are among the key factors propelling the need for co-crystallization process. Micro-encapsulation process accounted for around 40% of the overall market share in 2017. Technological benefits including precise release of nutrients at the right place and time will drive the microencapsulation market growth. Increasing necessity to improve the effectiveness of food additives and broadening of the application range for food ingredients are likely to support product demand. Nano-encapsulation process will witness gains at over 4.5% CAGR up to 2024. The rising demand for nanocapsules to deliver bio-actives to the appropriate physiological site via targeted delivery will drive the demand. Improved shelf life particularly for processed meat, fish, and ready to eat meals will propel the encapsulation technology adoption over the projected timeframe. Food & beverages is anticipated to be valued over USD 5.2 billion by 2024. Growing packaged food products demand due to the rising preferences of youth towards confectionery products and snacks have increased the market demand. Smart drinks category is gaining a speedy business attention in the competitive beverage market as per the increasing consumer’s concerns for their healthy lifestyle and the focus on fully fledged diet trend. Other end-use areas such as cosmetics and personal care is expected to observe growth over 4% up to 2024. Consumers tend to spend more on personal care products due to the increasing affordability and preference to maintain healthy lifestyle. 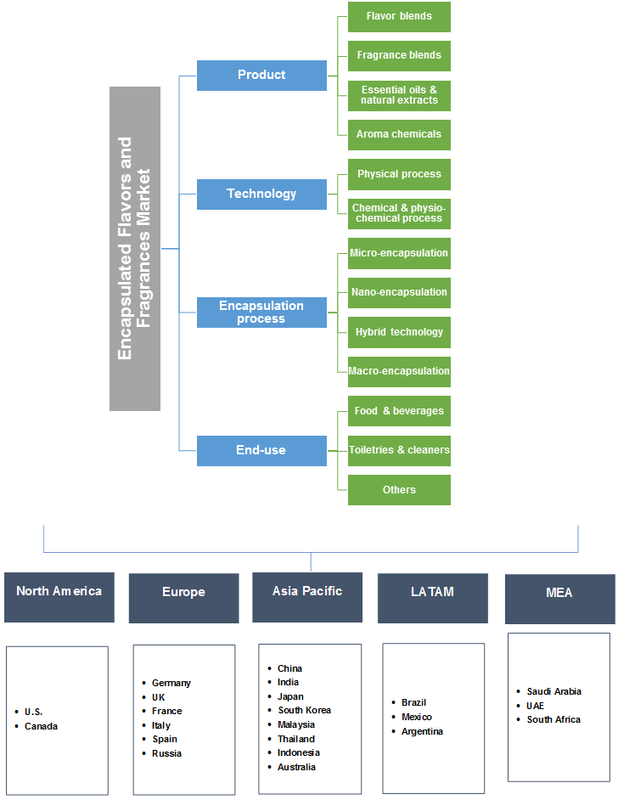 Asia Pacific encapsulated flavors and fragrances market is the fastest growing region and will witness over 4.5% CAGR over the forecast timeline. This development can be attributed to the increasing population along with rising per capita income. Key factors including surging growth in the food & pharmaceutical industry and rising demands in the cosmetics products will fuel regional industry growth. North America encapsulated flavors and fragrances market revenue accounted for over 30% of the overall industry in 2017. Increasing concern to improve product shelf life, rising consumer health and diet related concerns & demands for dietary medical supplements, and to improve the quality & time period are positively influencing the market size. Global encapsulated flavors and fragrances market share is competitive in nature with the presence of various local as well as international players. Firmenich Incorporated, Symrise AG, FrieslandCampina Kievit, Tate & Lyle PLC, Cargill Incorporated and Ingredion Incorporated are among the key market players. Other industry participants include Aveka Inc, Mane, Nexira SAS, Synthite Industries Ltd, Sensient Technologies Corporation, Sonarome, and Lycored Group. The manufacturers focus on adoption of various growth and expansion strategies including technological advancements, agreements, mergers and acquisitions, product portfolio expansion and new product launches to strengthen their industry foothold. Encapsulation is a process in which a material is captured or coated within another material. The coating material is known as encapsulated or shell whereas coated material is termed as core or active material. Encapsulation of flavor comprises of protecting a mixture of molecules or a flavoring agent with a dedicated envelope. This technique helps in providing uniform and improved taste, protection from harsh conditions and extended shelf life. Encapsulation of fragrance is mainly used in the textile industry for manufacturing perfumed suits for customers and in food & beverage industry to maintain the freshness of the product. There are various techniques used for the encapsulation such as spray drying, spray chilling, fluid bed coating, extrusion etc.